In 2001 Dorothy Miller went to Mecklenburg, at the age of 87. Here is her outstanding report. It all began in the Fall of 1993 when the BELDING and SCHUETTE families from the State of Michigan were looking for the grave of an ancestor in a cemetery in Schwerin, Mecklenburg. They found the old tombstone hidden under a tree. The next grave had a name they recognized, a new tombstone and fresh flowers. Since they were going home the next day, they did not have time to look up information about the grave. What to do? Miriam BELDING wrote a note giving her home phone and address and explaining the relationship. She put it in a plastic bag, enclosed money for postage, and put the baggie under the flowers. Three weeks later she had a phone call from Renate BERGER in Schwerin, a real relative. The grave was that of Renate's mother. Then followed phone calls, letters, exchange of family information. Since I, Dorothy MILLER, am a distant cousin and do lots of research into those German families of MÜHLENBRUCH, MAHNCKE, WIESE and so on, I also got into the information exchange. By the summer of 2000, Renate had said "If you will come again, I'll arrange a meeting with a lot of your present day relatives. " In October, Miriam and I went to Salt Lake City, Utah for research. That's when we decided we HAD to go to Mecklenburg. 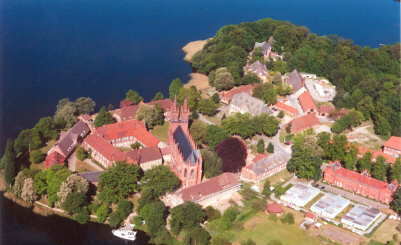 Mecklenburg is one of the most northern states of Germany, up by the Baltic Sea Until the Berlin Wall fell, it was part of East Germany, dominated by Russia, isolated from the West, including from relatives in the United States. In 1993, when the BELDINGs and SCHUETTEs had been there, everything was dreary, rundown, unpainted. 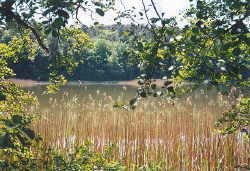 But the country was beautiful, lots of lakes, lush vegetation, wonderful flowers. So the PREPARATION began. Well, actually, it had begun years before. Miriam's uncle, Carl LEMBKE, had written a mimeographed family history based on his mother's knowledge and the many letters he wrote and received between the two World Wars. I began searching in 1975 when my mother died. Fortunately I was able to read the actual church records which were not available to Mr. LEMBKE. They could be read right in my home town of Albuquerque, NM at the Family History Centers of the Mormon Church. Together, Miriam and I had enough information to know where we would like to visit. Miriam wrote and called when the message needed to be in German and made the arrangements. I handled the English. I also searched the internet for the addresses of Archives and libraries, AND for new relatives. We located three different connections to two distant MÜHLENBRUCH lines about whom we had known very little.. Miriam's sister, Margaret SCHUETTE, searched for the best way to travel. And we set an itinerary and our goals. Miriam and Margaret wanted to see the places where our ancestors had lived, worked and worshipped. I especially wanted to prove that the earliest ancestress of whom we knew, Anna CARSTENS, was the descendant of a Lutheran pastor, Statius CARSTENS, who had served in St. Dyonis and Bardowick in Hannover during the Thirty Years War. That was a religious war, 1618-1648, involving Denmark, Sweden and France, all of whom invaded Germany at one time or another. We also wanted to see the church in Mestlin to see if we could find a gravestone for Anna Margaretha (FRIESE) MÜHLENBRUCH who church records said was buried inside the church in 1781. We all wanted to meet relatives. On 19 June 2001, the six of us, Dr. Art and Miriam (SCHUETTE) BELDING and their son Ted, Gertrude and Margaret SCHUETTE and Dorothy MILLER, met in the airport in Chicago and flew together to Berlin via Amsterdam. Getting our cars was a lengthy process, but we had an Audi and a Mercedes. Pretty fancy transportation, wouldn't you say? In Berlin we stayed at Hotel-Pension-Lydia in a northern suburb. Hotels in the center of Berlin are expensive. We were close to both busses and trams so we used public transportation and did not have to fight the traffic. We had breakfast with our lodging but walked to a good restaurant in the neighborhood for dinner. Lunch was whereever we were sightseeing. We saw the old Rathaus, the Reichstag, the new government buildings for the "new" capitol, Berlin. The new malls, one with a three story high water clock. We saw areas with lots of graffitti (so like that in the US that I wonder if there is an international graffitti language) but we saw construction and revitalization everywhere. Buildings painted fresh new colors. People cheerful, even though there is still lots of unemployment. Many people were doing street performances, being clowns, drawing pictures. You had to wonder if it was because they could not find other jobs. The Brandenburg Gate was being restored and was covered with a huge photographic painting on canvas, so that from a distance we thought we were looking at the real thing. There was a large crowd of people and cars. We learned that Prince Hassan, the brother of the recently deceased King Hussein was making an official visit, since he is the new envoy from Jordan to Germany. The most impressive place to me was the Kaiser-Wilhelm-Gedächtnis Kirche. 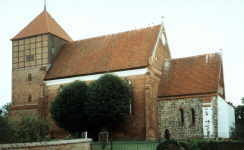 The old church, built in 1906, was destroyed in an air-raid on 23 Nov. 1943. After the war, when it was proposed to tear down the ruin and build something new in its place, the people of Berlin objected. 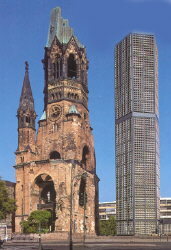 The riddled tower remains surrounded by four starkly modern buildings filled with stained glass. The entrance hall of the old church is now a museum with the patched remains of the glorious mosaics which had decorated the walls and ceiling, and the broken statue of Christ which was pulled from the ruins. Most compelling are two crosses, both given as gestures of reconcilation. The Cross of Nails is made from nails in the burnt out roof timbers of the Cathedral in Coventry, England which had been reduced to ashes in a German air-raid on 13 November 1940. The second is an icon cross given by the Russian Orthodox Church in memory of the victims of Nazism and as a symbol of peace on earth among men of goodwill. The new church is an island of tranquillity, an incredibly peaceful space of blue light; light filtered through the stained glass walls of blue with flecks of other colors. They were designed by French artist Gabriel Loire of Chartres.. A place of contemplation and reflection. It was also a place of near disaster for me. After we left the church, I discovered that my wallet was missing. That meant my driver's license, my Deutschemarks, my credit card were gone. I went back to the place in the church where I had been sitting. Nothing. Under the seats. Nothing. I could not think what to do so I looked again. This time I looked far beyond where I had been. There, on the floor, in the dark was my wallet. Out loud I said: "Gott sei Dank". Three German ladies began talking sympathetically to me. They were so fast I could not understand, but I am sure that they were reminding me that God watches over people....even the careless ones. For a Westerner, Mecklenburg is not very big. 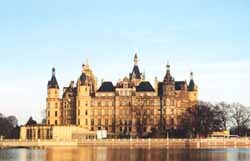 It is only about 175 miles from Berlin to Schwerin as the crow flies, about 100 miles more as we drove. So, on our trip from Berlin to Seehotel Cramonshagen, near Schwerin, the country inn where we would make our base, we were able to start our visits to the villages of our ancestors. We stayed off the Autobahn and traveled the beautiful, two lane country roads to Mirow and Röbel. Both were places where our earliest ancestors, Johann Dietrich MÜHLENBRUCH and his wife Anna CARSTENS had lived. Johann served as Küchenmeister, a sort of household manager, from 1703 til his death in 1732, for the Herzog (Duke) Adolph Friedrich of Mecklenburg-Strelitz. In WWII the Mirow church had been burned by the Germans because it was being used by the Russians as a lookout. We were lucky enough to be there at the same time that the pastor, Dr H. J. LIPPE, who speaks English was setting up for a concert. He personally showed us around, pointing out the rebuilding done by the parishioners themselves, including the organ. Then we found the small palace used by the ruling family and tried to imagine whether our Johann had lived nearby. At Röbel our Johann Ludwig Otto MÜHLENBRUCH had been the city secretary and notary and his son, Johann Gregorius, who was an ancestor to all of our party, was born in 1735. Johann Gregorius MÜHLENRUCH is the man whose silhouette we have. At dinner that night in Cramonshagen, we had, of all things, AN AMERICAN BARBECUE. !! It was planned in our honor by the host, Herr Normant BEHNING. Barbecue goes well with the local beer! Renate BERGER and her daughter, Petra MUNDT, came out to meet us and to welcome us to Schwerin. They speak no English and three of us speak no German, so there was lots of translating. Neat things happened to us in Schwerin. Our new relatives invited us to their homes for a "grill"----like our barbecue, but with a lot more food. Renate had a grill in her garden. There are areas where small plots of land are packed, fence to fence, filled with fruit trees, vegetable gardens, beautiful flowers and small houses. Renate said that she could not have lived through the days of East Germany if she had not had her garden as a retreat and escape. Martin-Peter and Anja BRITTING and their daughters also invited us to a grill and get-acquainted time. Edith BRITTING took us on a walk through Schelfstadt, the section where many of our ancestors had lived, and where she had grown up. We saw the places where the WIESE and MAHNCKE bakeries were or had been. We found the very house where my great grandparents had lived in 1880. We worshipped in the church where my granddparents were married and where others of the family had been members. We saw the beautiful castle, the Schloss, of which everyone is so proud. And we had our family "RE-UNITING". I chose that word because these families had never met before; yet it was a re-uniting of the descendants of those who had remained in Germany and those who had emigrated to the United States. We gathered at the inn in Cramonshagen first for kuchen and coffee and then for dinner. Our group of six were joined by four others from the US. Liz (SCHUETTE) TINKER, sister of Miriam and Margaret, and daughter of Gertrude, came with her family. We joined 35 from Mecklenburg. Anja BRITTING had prepared a huge wall pedigree chart and a booklet of the WIESE family. We had brought our own charts to share. I only wish that I could have spoken German well enough to get all the stories in that room. At Mestlin, where our Anna Margaretha FRIESE, wife of Johann Gregorious MÜHLENBRUCH, is buried inside the church, the pastor Probst Jens KRAUSE had books about the town and the twelfth century church ready for us. He personally showed us the church, and led us up the steep little circular staircase into the belfry where he rang the bell for us. In the church floor are grave stones from past centuries. But none for our Anna. The church record says that she was buried in front of the Amptsstuhl. Pastor KRAUSE showed us the old seat which had been used by town officials in the 1700's, but there is no record of where it was placed at that time. In Dobbertin, the place where Johann Gregorius and Anna were married, we walked into the church, full of scaffolding, with plywood over all the floors. A workman said "You cannot come in here. We are renovating." But the head architect in charge of the construction, Dr. Horst Alsleben, came up. He personally showed us through the church which had been built in 1220 for a Catholic monastary which became Lutheran after the Reformation. In Jördenstorf the pastor, Dr. Daniel HAVEMANN, his wife Annette and two of their children, Debra and Raphael, all showed us the lovely small church, including a picture of Christ which was painted on the inside of the door to the niche in which the Host was kept. This is said to be the oldest picture of Christ in Northern Germany. It escaped ravaging in the many wars because it was inside the door. When she heard that our ancestor, Samuel Christian HAGEN, had been organist and Kuster there in the late 1700's, the pastor's wife, Annette, asked if she could play the organ for us. The music in that small concert was glorious. Something about the size of the church and the vaulted ceiling added beauty to every tone. We were invited to visit Gerdshagen Hof, the ancestral estate of Casper Friedrich MÜHLENBRUCH. It had been taken over by the East German government to house refugees. More than 100 people had lived in the small apartments into which the home had been cut. After the Wall, it was bought was a West German family to be restored as a family home. We were introduced to the current owners, Michael and Bettina ARNDT, by Dr. Ursula (MÜHLENBRUCH) SCHMUTH whom I had discovered through the internet. The ARNDTS are restoring the place properly, as conservators. They gave us a walking tour of the grounds and buildings and then served us Kuchen, Kaffee, and history. Delightful. Dietrich and Dorothee MÜHLENBRUCH gave us a tour of Schwerin and invited us overnight to their home in Volkenshagen near Rostock. This was another far distant connection discovered through the internet. Dietrich descends from the youngest son of Johann Dietrich and Anna (CARSTENS) MÜHLENBRUCH. That son was named Statius after his mother's grandfather. We met ten more relatives, all from Dietrich's family. Sitting in the garden, soaking up every ray of sun which the North Germans hoard in the summer, we had more cake, huge bowls of fresh strawberries and cherries and more grill. Next day Dietrich and Dorothee drove us around to the estates where our common ancestors had lived and took us to the Baltic Sea where we strained our eyes trying to see Norway to the North. My personal highlight was getting to hold the small Kirchenbuch (church record book), begun in 1670 in the village of Himbergen, Hannover. The church archivist, Frau Lore NEUMANN, took us into the little room where the old church books were kept and asked which we would like to see. We chose the very first one. Several years ago in Salt Lake I found a funeral oration for Statius CARSTENS who was a Lutheran pastor during the Thirty Years Wars, 1618-1648. After reading the story of how he was run out of his parish by foreign soldiers, yet walked back to minister to his congregation, even though they had no food they could offer to him, I admired that man and wanted him to be kin to our first known ancestress, Anna CARSTENS. Anna was said to have been born in Himbergen, but we had no dates nor parents. On the third page of the little book, we found her birth, 9 December 1672, daughter of the pastor, Johann CARSTENS. From the funeral oration, we knew that Johann was the son of Statius. Anna WAS the granddaughter of Statius. WHAT A FIND. And we found her marriage to Johann Dietrich MÜHLENBRUCH, a date we had not known before. Himbergen alone was worth the trip. On 3 July, we said our goodbyes to Renate and her family, drove to Hamburg and on 5 July flew home. It was the best trip of my life. One I had never expected to experience, especially at the age of 87, almost. I am so very thankful. And I am thankful for the kind, welcoming people who made the visit memorable. Because of the horror of 11 September, we all have been re-thinking our own priorities, and trying to touch hearts and thoughts with our loved ones. We have had many messages of concern and sympathy from our new found relatives. They know from experience about suffering. Displayed in the Kaiser-Wilhelm church in Berlin, with the Cross of Nails from Coventry is a prayer which is recited at 1 pm each Friday both in Coventry and in Berlin. I'll end with two lines from that prayer.